Winds kept the Offshore fleet docked. 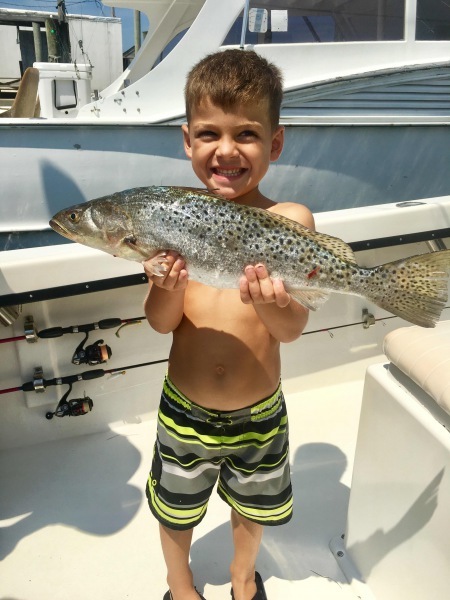 Inshore boats were able to get out though and reported keeper Red Drum and Speckled Trout. High winds and seas kept all the offshore boats in today. 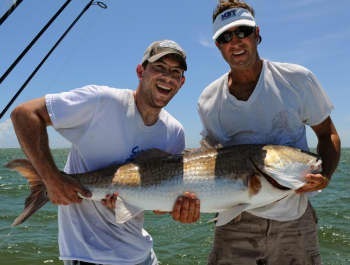 One of the inshore boats went out and had a great time catching Speckled Trout and keeper Red Drum. 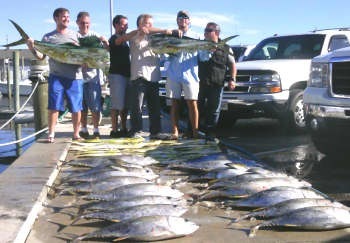 Southwest winds blew in today making for some not so good fishing conditions. 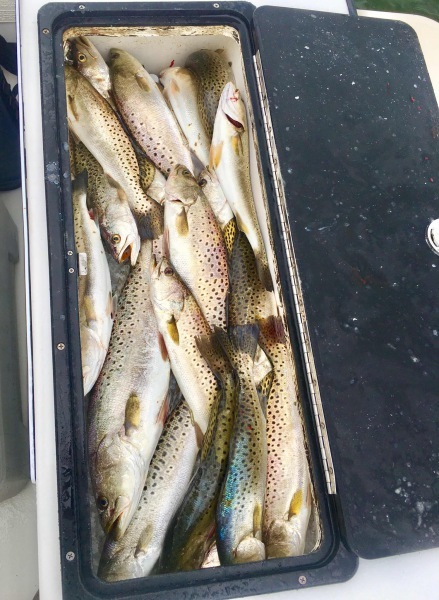 One inshore boat ventured out this morning and had a great time catching Speckled Trout. Another boat went near shore/ wreck fishing this morning and returned with Dolphin, Barracuda, and Sea Bass. Two boats went offshore and reported bumpy conditions. One Sailfish was released. 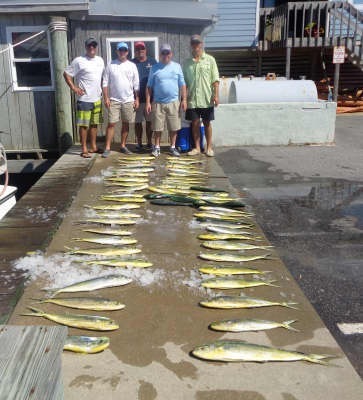 A few Dolphin and Wahoo were caught. It's supposed to blow for the next several days so check back to find out what's going on. 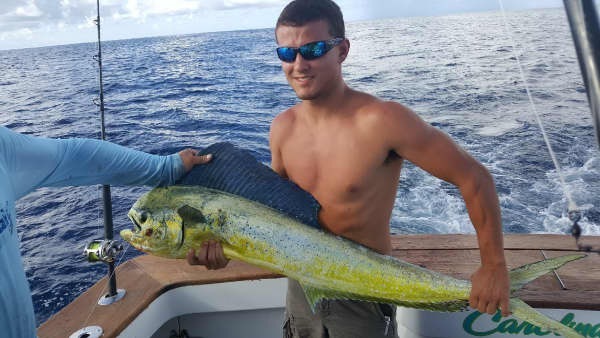 John Drago of Cary, NC: Sailfish release on Bite Me. With today's heat index, it was a great day to be on or near the water! 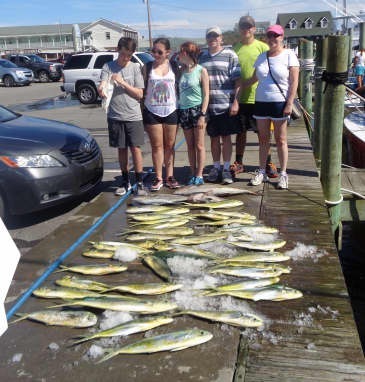 Inshore anglers enjoyed catching Speckled Trout, Spanish Mackerel, and Bluefish. 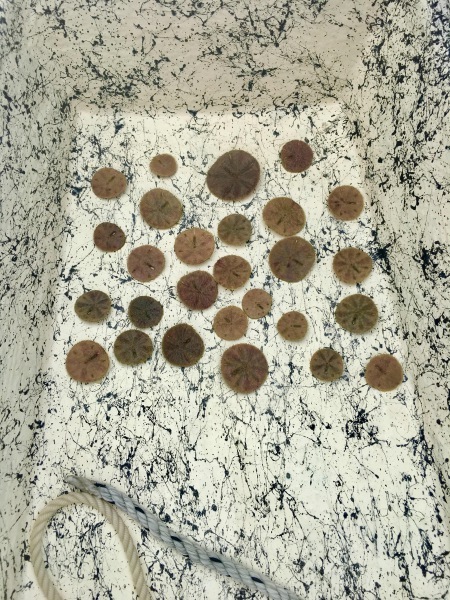 When it gets too hot, the nice thing about inshore fishing is that you can get out, sit or wade in the cool waters of the Pamlico Sound and maybe even dig for clams. 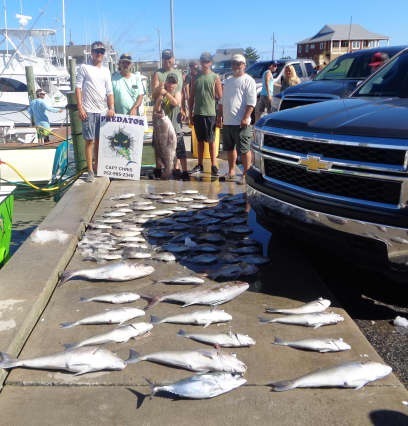 One boat fished near shore this morning and returned with medium Bluefish as well as Spanish Mackerel. Our offshore fleet released five Sailfish today. Dolphin fishing was scattered. 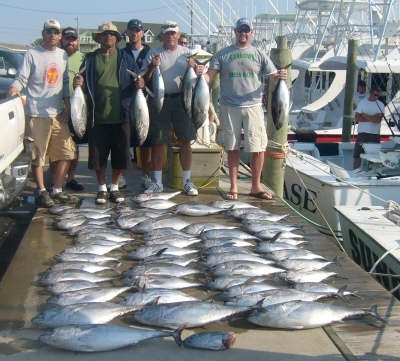 Several good catches of Blackfin Tuna were thrown on the dock this afternoon. 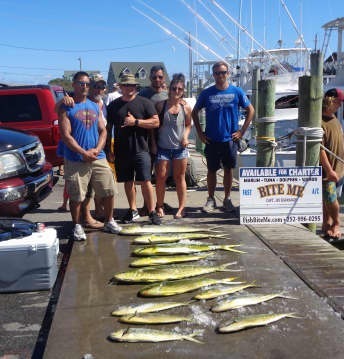 Several citation size Wahoo were caught. Tilefish, Grouper, and Triggerfish were the bottom fish caught today. 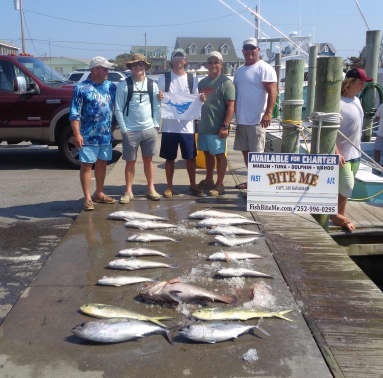 Nicholas Manzoni of Baldwin, MD: Sailfish release on Bite Me. Tyler Tinsler of Fredericksburg, VA: Sailfish release on Sea Creature. 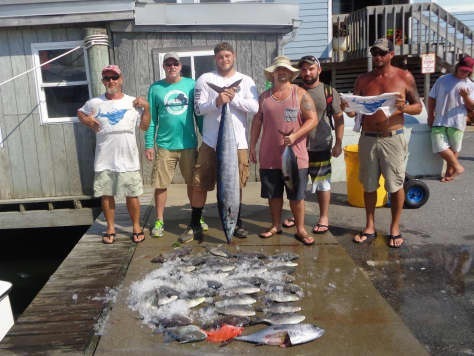 Brian Verne of Kill Devil Hills, NC: Sailfish release on Sea Creature. Blake Simmons of Fredericksburg, VA: 41 lb. Wahoo on Sea Creature. Elise Thomason (11 yrs. 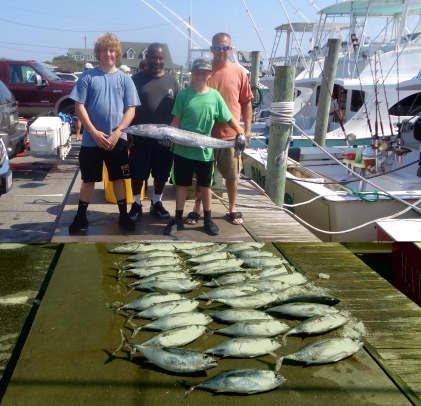 old) of Portsmouth, VA: Sailfish release on Lucky Chip. 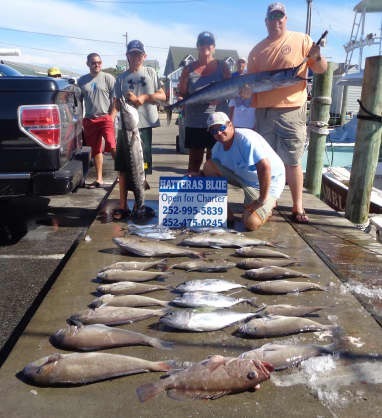 Brian Solis of Virginia Beach, VA: Sailfish release on Gambler. John smith of Charlottesville, VA: 26 lb. Grouper on Predator. Justin McCormac of Raleigh, NC: 49 lb. 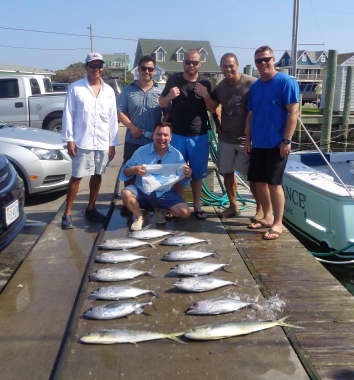 Wahoo on Hatteras Blue. 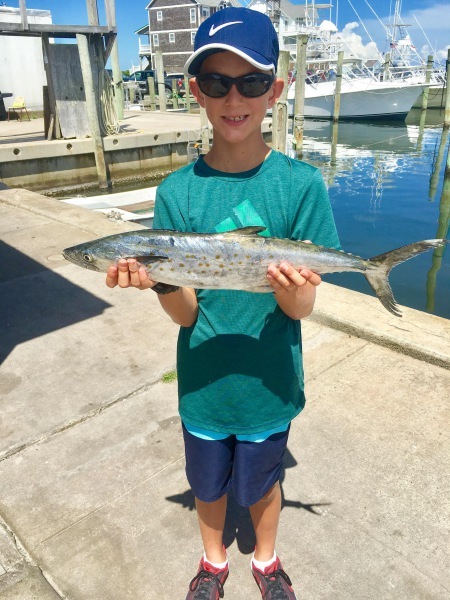 Caroline McCormac of Raleigh, NC: Barracuda release on Hatteras Blue. 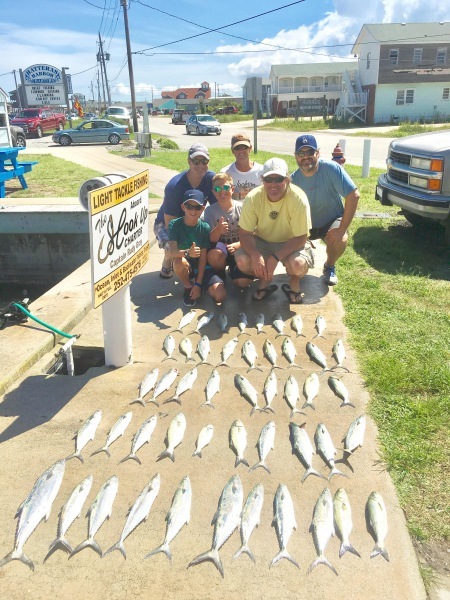 Summer is in full swing in Hatteras Village! What better way to spend time with family and friends than on the water. 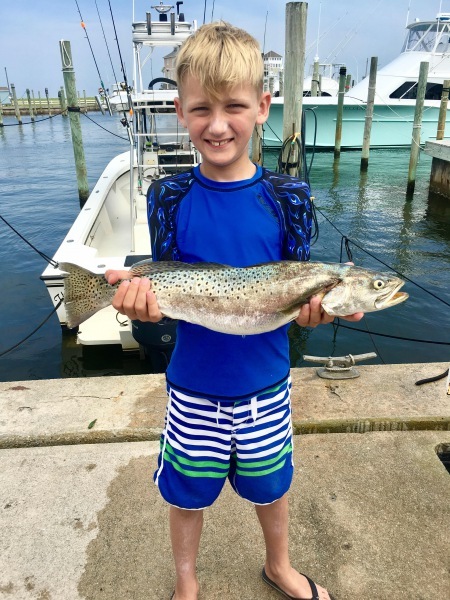 Inshore anglers spent the morning or afternoon catching limits of Speckled Trout. Drum fishing was good today. 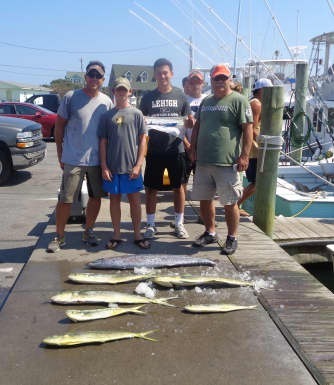 Bluefish,King Mackerel, and Spanish Mackerel kept everyone busy reeling! 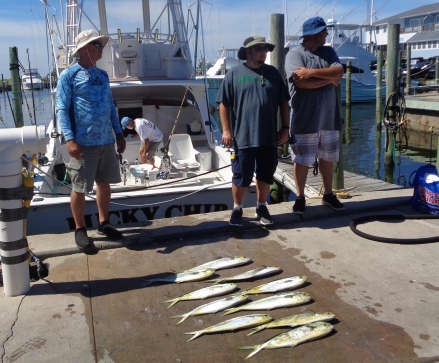 Offshore, the Sailfish bite was on again with three being released by our fleet. 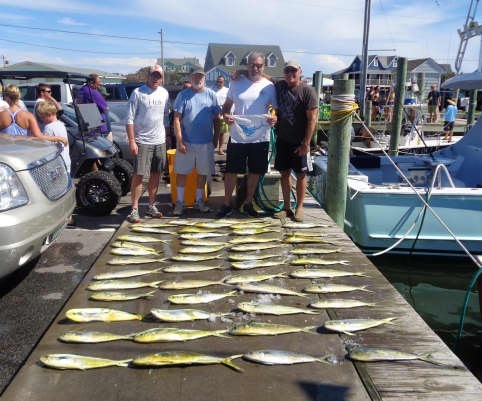 Dolphin fishing was good as well as the Blackfin Tuna bite. It was a slick calm day and there were quite a few family groups with youngsters who had a great experience on the water. Rob Beasley of Edenton, NC: 44" Red Drum release on Tradition. 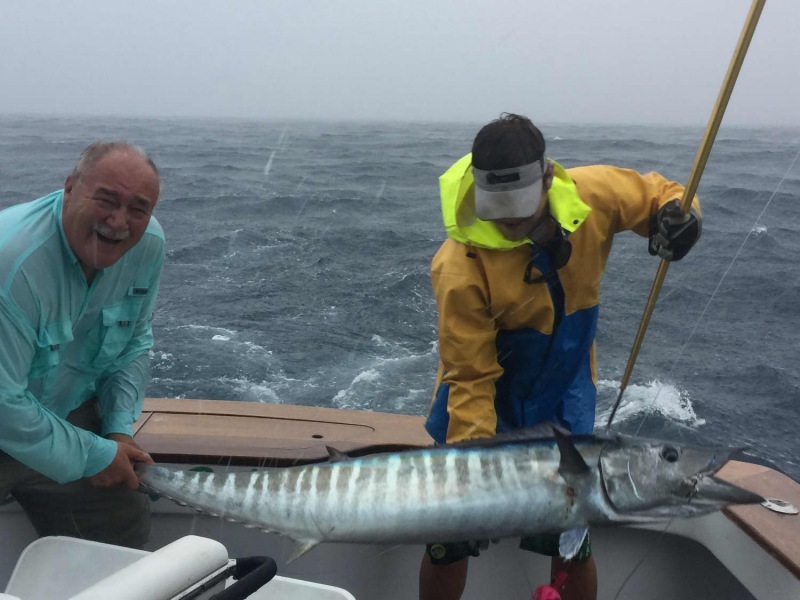 Peter Pugh of Collierville, TN: Sailfish release on Reliance. Jacob Stegal of Denver, NC: 29 lb. Grouper on Release. 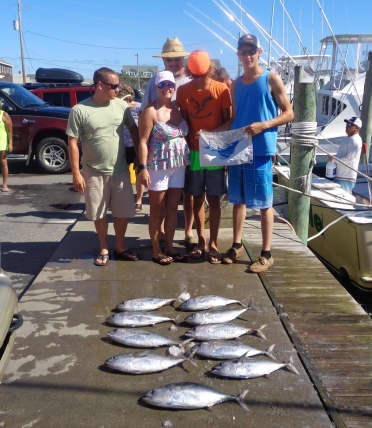 Aiden Copeland of Elizabeth City, NC: sailfish release on Hatteras Fever II. Kelsie Stingo of Masontown, WV: 20 lb. Grouper on Carolina Girl. Andrew Cottrell of Morgantown, WV: Sailfish release on Carolina Girl. Arrington Payne of Shady Spring, WV: 41 lb. Grouper on Predator. Richard Raught of Petersburg, VA: 11 lb. Gray Tilefish on Predator. It's been a gorgeous summer day! Lots of happy vacationers enjoying time in or on the water. 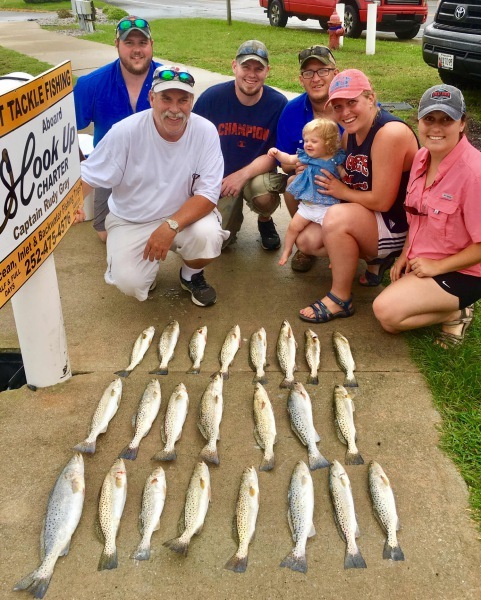 Inshore anglers had a great time catching Speckled Trout and big Bluefish. The Red Drum bite was good all day! Offshore, six Sailfish were released by our fleet. 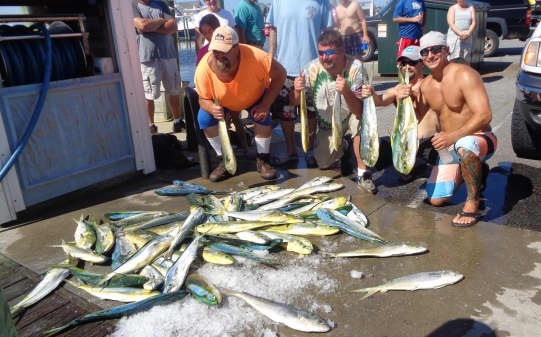 Anglers returned with limits of Dolphin. The Wahoo bite was good again today and a handful of Blackfin Tuna added some variety. 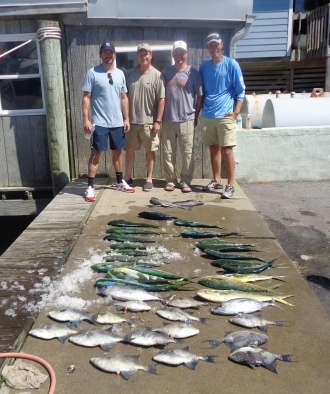 Bottom fish included Triggerfish and Grouper. We are thankful that the weather and the fish cooperated today - it's about as good as it gets! 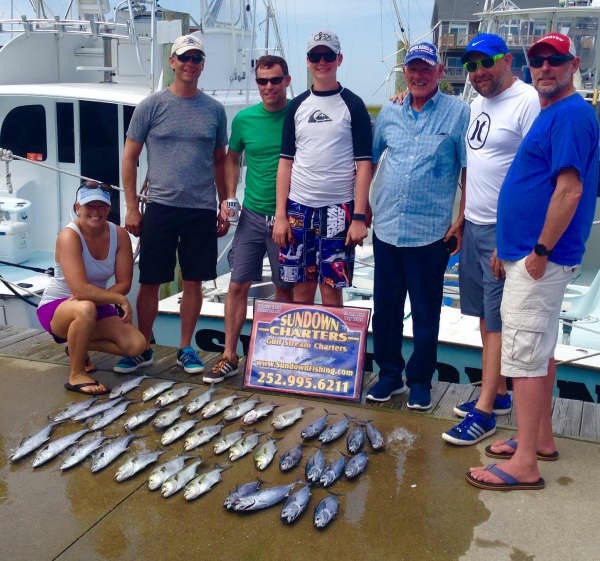 Don't miss out on the action - call 800-676-4939 to book your trip! Logan Zell ( 11 yrs. old) of Mount Joy, PA: Sailfish release on Carolina Girl. Evan McClelland (13 yrs. old) of New Albany, OH: Sailfish release on Carolina Girl. 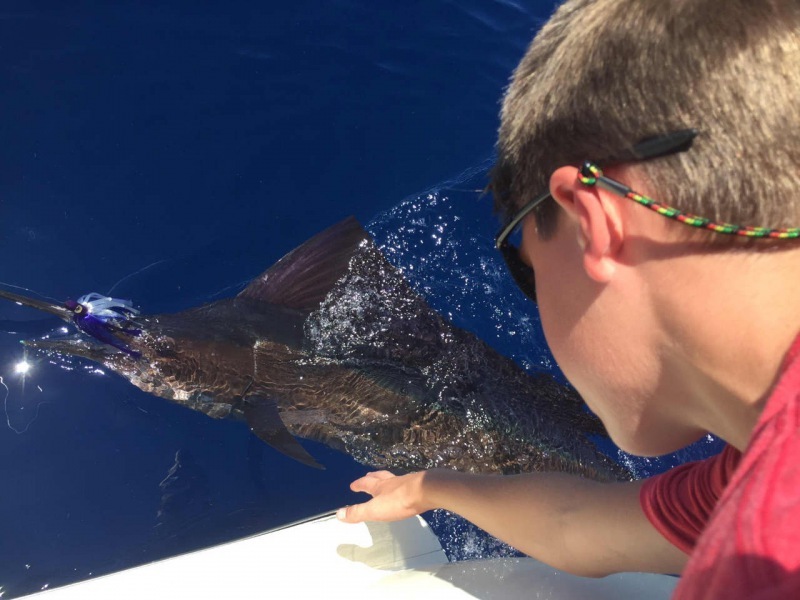 Ethan Bourgeois of Raleigh, NC: Sailfish release on Release. Derek Camp of Adairsville, GA: Sailfish release on Gambler. Craven Sykes of Greenville, SC: Sailfish release on Bite Me. Barber Sykes of Greenville, SC: 42 lb. Dolphin on Bite Me. 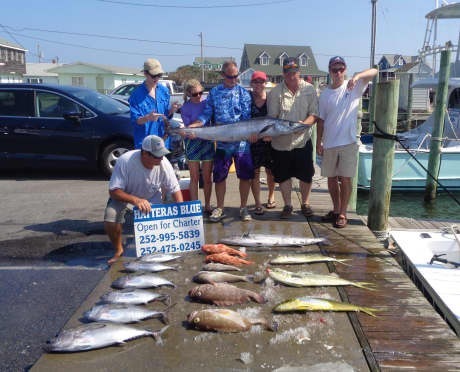 Rick Dukovich of Pittsburgh, PA: Sailfish release on Hatteras Fever II. Doug Spencer of Merrimack, NH: 7 lb. Triggerfish on Predator. Steve Beaton of Boerne, TX: 22 lb. Grouper on Predator. Jonathan Flathman of Savannah, GA: 41 lb. 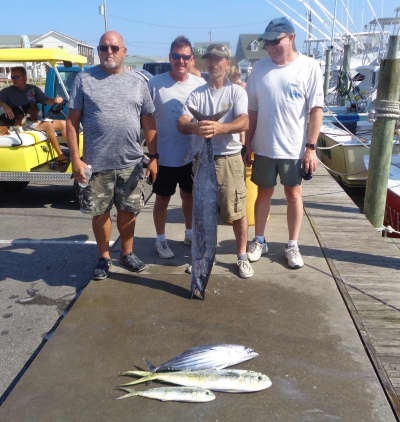 Wahoo on Hatteras Blue. Rainy start to an overcast day. 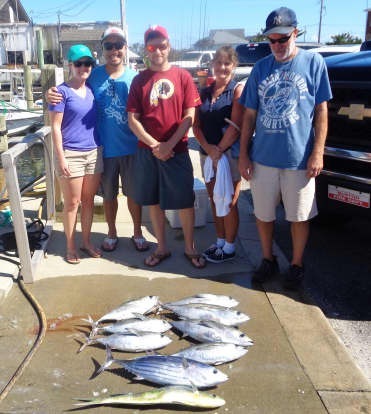 Boats fishing offshore came back with fair to good Dolphin, Blackfin Tuna, Tilefish and citation size Wahoo. 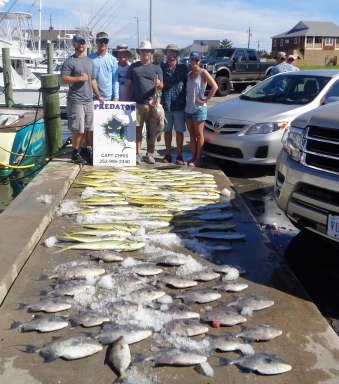 Sailfish were working the waters today with several being caught and released from the Hatteras fleet. Inshore boats fished in slick calm waters with a bit of overcast. 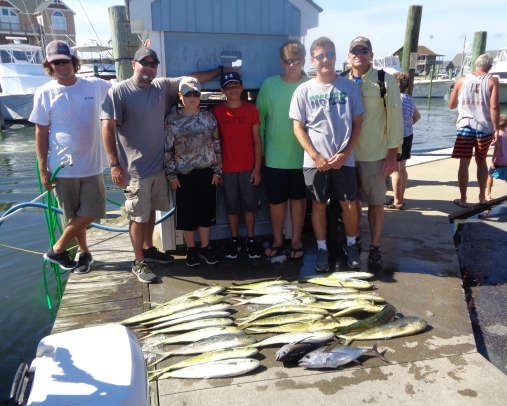 They had great catches of Speckled Trout and Bluefish and released large Red Drum. Tradition: Christine Stych of Jamesburg, NJ released a Red Drum. Bite Me: John Hewitt of Fernandina Beach, FL caught a 46lb Wahoo. 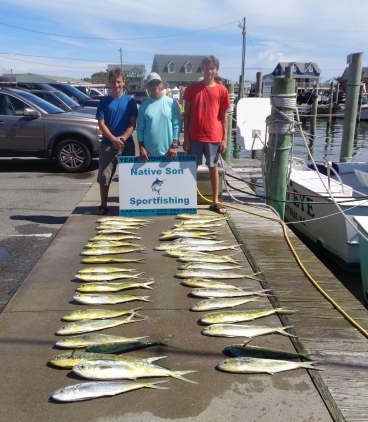 Release: Christopher Keating of Jarrettsville, MD caught a 10lb Tilefish. 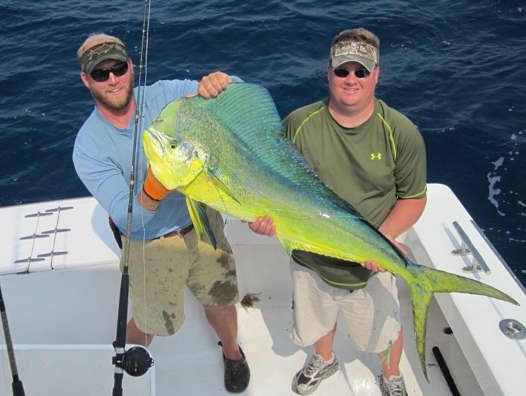 Kyle Keating of Jarrettsville, MD caught a 12lb Tilefish. Lucky Chip: Dallas Pitcock of Sandston, VA released a Sailfish. Sea Creature: Joseph Schwartz of Tilghman, MD released a Sailfish. A few boats out Offshore today with a rainy start to the day. 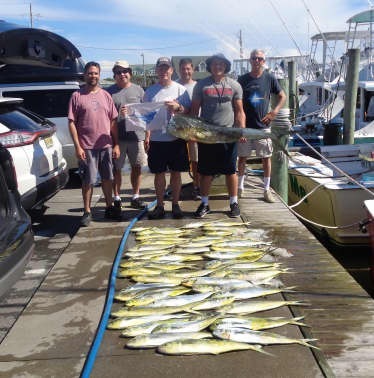 They reported fair Gaffer Dolphin, a few Yellowfin Tuna and scattered Blackfin Tuna and few Wahoo including a whopper citation (check the pictures!). Bottom fishing went well with Triggerfish and Grouper. 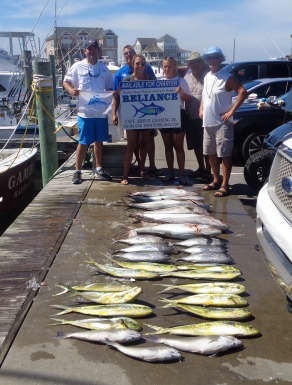 Bite Me released a Sailfish and Carolina Girl released a White Marlin. Inshore boats waited out the morning storms and caught Red Drum and coolers full of Speckled Trout. 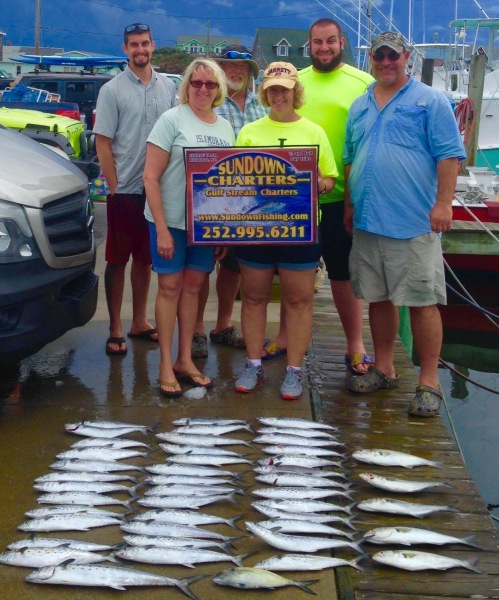 Nearshore boats were catching great Spanish Mackerel and Bluefish. 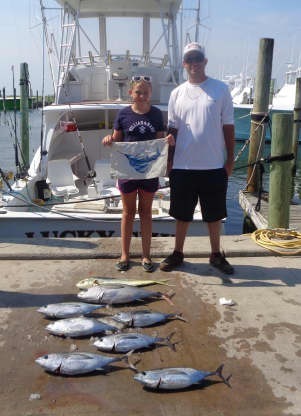 Carolina Girl: Preston Avery of Eagle, ID released a White Marlin. 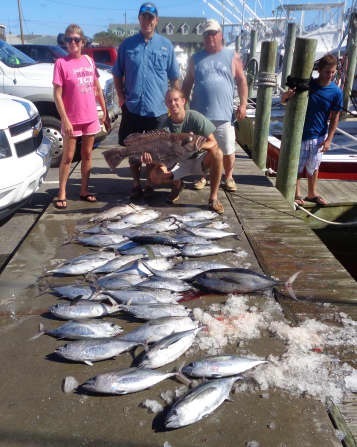 Mike Bradshaw of Suffolk, VA caught a 61lb Wahoo. Bite Me: Cathy Reynolds of Pipersville, PA released a sailfish.